Were you in Las Vegas this summer? 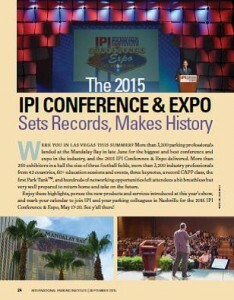 More than 3,200 parking professionals landed at the Mandalay Bay in late June for the biggest and best conference and expo in the industry, and the 2015 IPI Conference & Expo delivered. More than 250 exhibitors in a hall the size of three football fields, more than 3,200 industry professionals from 42 countries, 60+ education sessions and events, three keynotes, a record CAPP class, the first Park TankTM, and hundreds of networking opportunities left attendees a bit breathless but very well prepared to return home and take on the future. Enjoy these highlights, peruse the new products and services introduced at this year’s show, and mark your calendar to join IPI and your parking colleagues in Nashville for the 2016 IPI Conference & Expo, May 17-­20. See y’all there! Three keynote addresses offered industry-specific and general-business information attendees could put to work right away in their businesses. As always, they were very entertaining to boot! First up was John Martin, CEO and co-founder of GenerationMatters and CEO and co-founder of the Southeastern Institute of Research, with “Ten Transcendent Trends Reshaping the Future of Parking.” He talked about changes and virtual winds pushing the industry forward and said the industry has “surely earned the right to say Parking Matters®. You guys have been at the point of change,” he said, and focused on the trends that will shape the industry from here, including less vehicle ownership, increasing favoritism toward online shopping instead of in-person, and autonomous vehicles and growing shared mobility models. Congratulations to the winners of this year’s Expo Best in Show awards! HUB Parking Technology, Watry Design, Inc., and Amano won Best in Show in their size categories. Passport Parking won second place, and Genetec won third in their category. The People’s Choice award was won by Nagels North America. Competition was tough among so many creative and eye-catching booths. We can’t wait to see what everyone comes up with next year! IPI’s Smart Parking Alliance hosted the first-ever Park TankTM, offering six highly ranked entrepreneurs the chance to swim with our very own parking “sharks.” Each of the competitors revealed new approaches to parking challenges, but Smarking stole the hearts of the judges and the audience, garnering both the grand prize award and the people’s choice. Keep your eyes peeled on the shoreline—Park TankTM will be coming up for another round of intrepid business leaders in 2016! Bank of America Plaza, Los Angeles, Calif.
BI Group Place, Houston, Texas. Canopy Airport Parking, Denver, Colo.
Charles Square Garage, Cambridge, Mass. Cornell Forest Home, Ithaca, N.Y.
Silver Spring Metro Plaza, Silver Spring, Md. Westpark Corporate Center, Tysons, Va.
Green Garage Certification has been called the “LEED of parking.” For more information, visit greenparkingcouncil.org. On behalf of the International Parking Institute and the University of Virginia, congratulations to our outstanding CAPP class of 2015. The 54 CAPP graduates—the largest class in the program’s history—come from private and public, U.S. and international parking organizations at universities, cities, airports, corporations, technology providers, consultants, and transportation authorities. About 800 IPI Conference & Expo attendees met and mingled with their industry colleagues at the Mob Museum, the National Museum of Organized Crime and Law Enforcement. Afterward, attendees enjoyed the Fremont Street Experience, a five-block entertainment district in historic downtown Las Vegas. The IPI Board participated in a “thriller” of an event. They saw Michael Jackson ONE, the Cirque du Soleil show featuring songs by Michael Jackson. The acrobatics, dance, and visuals took them on a journey through the music and spirit of Michael Jackson. This year’s international welcome reception was a special treat for 455 attendees from more than 40 countries. IPI’s new Young Professionals in Parking (YPIP) group kicked off in a very cool way at the Minus 5 Ice Bar. (We think parking peeps in parkas rock.) The sold-out event was a big hit and the perfect way to launch this new group, designed for parking professionals younger than 40. Look for a schedule of YPIP-hosted events starting this fall and a YPIP Facebook Group launch in September! Congratulations to this year’s Expo-Opoly winners! Tracy Read, Middle Tennessee State University, and Gael Aime, Lancaster Parking Authority, each accepted their giant checks after playing the game and entering the drawing. Enjoy your winnings! 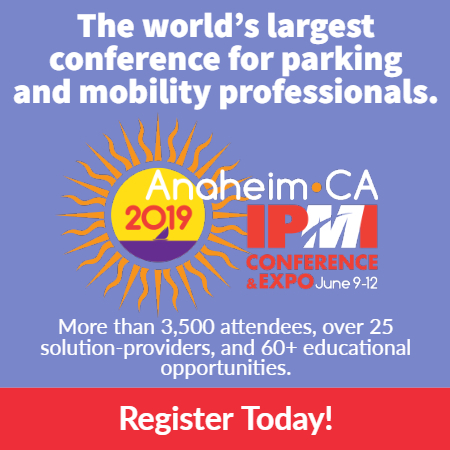 IPI’s new Accredited Parking Organization (APO) program launched at the 2015 IPI Conference & Expo­—honoring five parking organizations in the inaugural class. The APO gives parking organizations a standard to measure their progress in achieving industry best practices. The accreditation process will inspire organizations to improve their programs, facilities, services, and results,and promote an organization-wide focus on efficiency and excellence. Read more about this year’s APOs in the August issue of The Parking Professional and learn more at parking.org/apo. This year 30 runners and walkers took to the Las Vegas strip at 6 a.m. Jenny Chavez was the first-place female. Former IPI Board Chair Casey Jones, CAPP, came in first place for the men with a photo finish against Joel Martin. Last year the two were in the reverse order. Great motivational rivalry! IPI in Vegas proved to be a stellar year for professional development with the introduction of the Building and Construction Management track. This track offered LUs and PDHs for attendees in need of those credits. We once again had the ever-popular Ignite sessions and introduced our online session evaluations using the IPIConf app! Proving that everything in Vegas has maximum returns, IPI added a new ShopTalk this year called Trending Now! Five ShopTalks and five more track wrap-up sessions at the end of the conference presented in a ShopTalk format that gave attendees everything they wanted. These are the perfect sessions for learning new perspectives and meeting others in your sector.